Ever since our arrival in Iceland, we had been waiting for one thing. I suppose everyone paying a visit to this remote part of the Northern Atlantic harbors a desire to experience what we were hoping to be a part of. A dim streak of light peeks out of the night sky, slowly turning into a spot of perceivable light, not that of stars or moon or other celestial bodies, but something different. Something more subtle, more faint, but at the same time acutely perceptible and seen not only with the eyes, but felt with the whole being. Almost unnoticed, the colorful arrays begin to take over the black of the heavens, until it seems like the entire contents of a painter’s kit have been tossed about the atmosphere and scattered all around by invisible winds. This is exactly what I began to observe, while absentmindedly staring out into Day Three’s miserable night from the window of the Dacia. In addition to our sleeping quarters, the vehicle had now also become our kitchen and dining room. Every time night caught up with us in a place even remotely removed from artificial lighting, we had found ourselves wishing and hoping that the sky would glow. 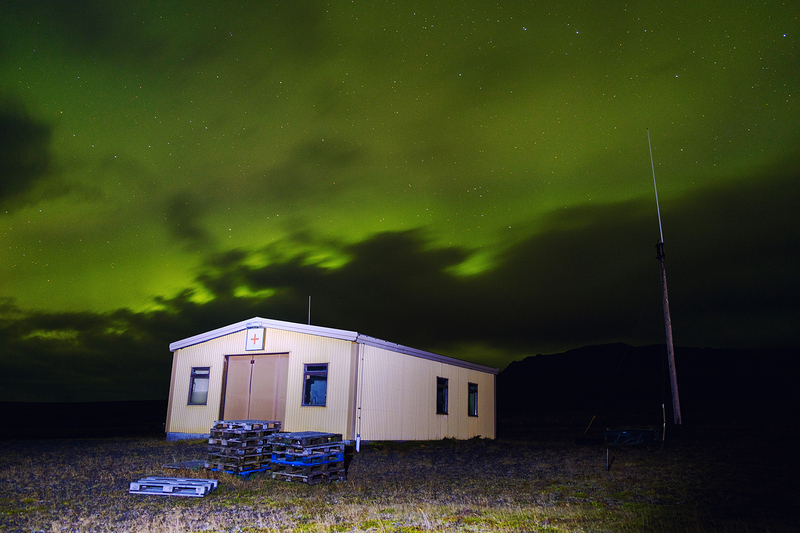 The word ‘aurora’ would inadvertently sneak into the conversation and we would wait for the usually-present clouds to part and reveal the glories of the northern skies. On this occasion, although still remotely hopeful (hope dies last! ), we were beginning to realistically expect nothing more than another cold, cramped night in the car, sleeping out in the middle of nowhere. 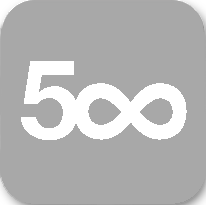 Outside was dark and freezing, thick clouds blanketed the sky and wind and rain lashed out at anything defiant enough to remain standing out the fields surrounding our makeshift camp. The weather was so poor that we had to eat our dinner in the back of the Duster. But, at that one moment, everything changed. As the glimmer of light expanded through a gap in the atmosphere above, the clouds slowly began to move. Tired, full of food and already changed into ‘indoor’ clothing, the last thing we had planned to do is venture out of doors. However, by now, we were beginning to realize what was about to occur. 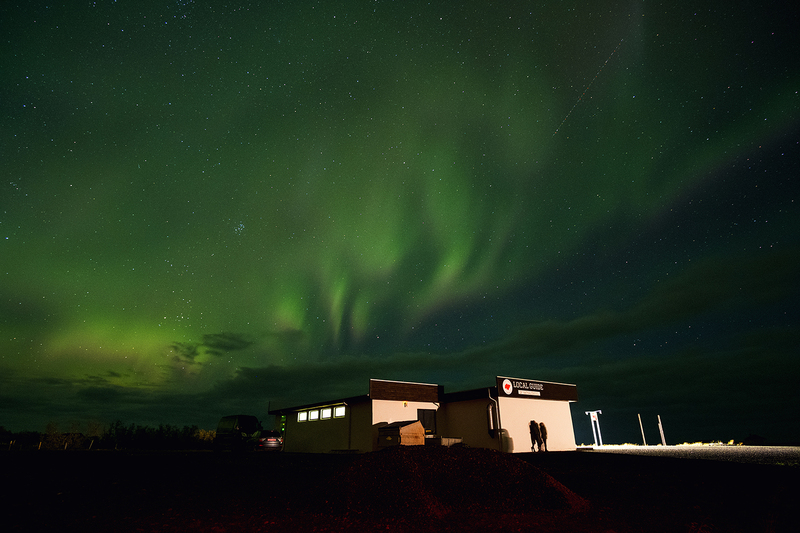 At this most unlikely of moments, we were being gifted the long-awaited experience of witnessing the unique presentation of the Icelandic skies. A privilege exclusive to those having ventured above the Arctic Circle. The Northern Lights had come. About as quick as is humanly possible inside a small SUV, we put away the dinner items and remaining food, changed into outdoor layers, got the tripods and cameras ready and rushed outside to find a suitable observation spot. Luckily, there were a few buildings about us, in the field next to the gas station. 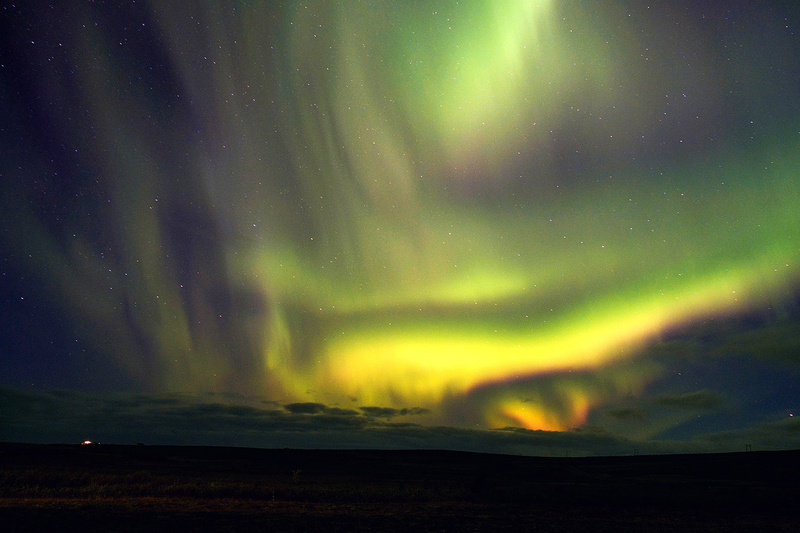 Photographing the aurora without a static point of reference seldom makes for interesting pictures. 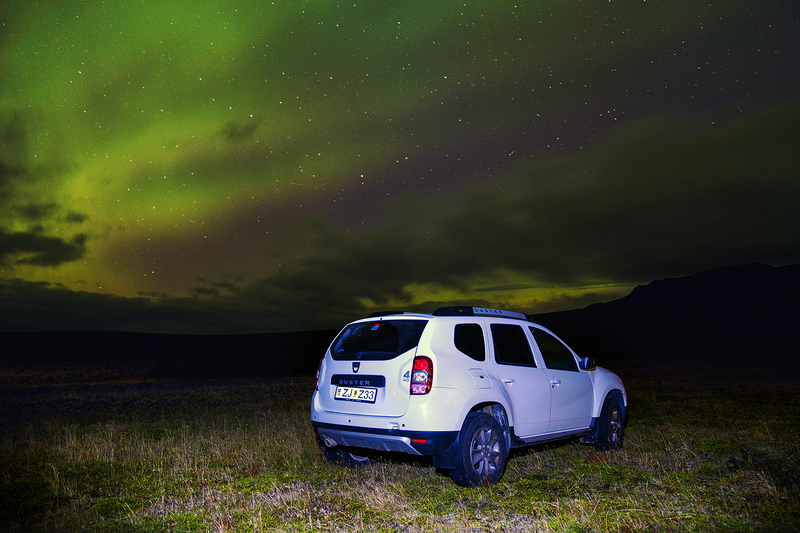 Our encounter with the fabled light show was truly spectacular: Surely, this must be the luckiest Dacia Duster in existence: The colors seemed to have enveloped the entire sky around us. It was an overwhelming sight: After bearing witness to this amazing display, it was hard to go to sleep. Nevertheless, we had to – the plan that we were still sticking to, was to wake up before sunset and drive down in the direction of the Jökulsárlón lagoon. We would then attempt to photograph the famous Iceberg Beach, (hopefully) illuminated by the rays of the rising sun. The weather’s cooperation was an obvious key component. Would nature remain graceful and would our lucky streak continue? Only a few hours of sleep separated us from the answer.